Need an easier brushing experience for your child? You've reached the right place. 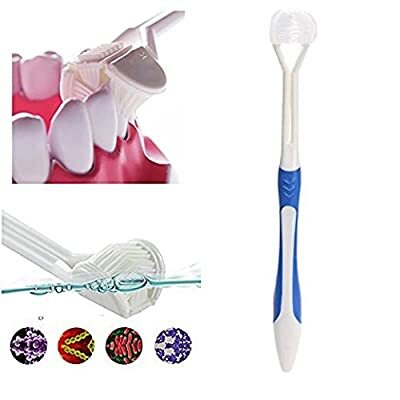 bA1 Health's 3-sided toothbrush both guides cleaning and encourages independence for those with sensitive teeth or sensitive gums, especially for those with Autism or Special Needs. Our brushes are clinically proven to remove plaque at the gum-line and are safe, gentle and effective. Caregivers around the world have found brushing for special needs children much easier with 3 sided toothbrushes, so make your brushing experience easier today! Our brushes include expansion pleats that allow bristles to adjust to different tooth widths, and adjustable bristles depending on sensitivity, with warmer water=softer bristles, and cold water=firmer bristles. If you have a tough time getting you or your special needs/autistic children teeth clean, are looking for a way to make their teeth cleaner, and/or want an overall easier cleaning experience, try out bA1 Health's 3 sided toothbrush today! We guarantee our brushes make your teeth cleaner and your experience easier or your money back, so try them out today! Want an easier, more beneficial brushing experience for your Autistic Child, Baby, Toddler, or even any age kid/adult or yourself? Our soft bristle brushes offers easier, faster, and a more complete access to all teeth, without the struggle! Even works with braces and includes a tongue scraper to freshen breath! Our flavorless, antimicrobial brushes are BPA, Latex, and lead free, disinfecting, remove plaque and tartar buildup, and help improve dental and oral hygiene while lowering the risk for gingivitis, tooth decay, gum disease Caregivers around the world have found brushing for special needs children much easier with 3 sided toothbrushes, and with our expansion pleats that allow bristles to adjust to different tooth widths and massage gum-line's, it's now even easier! Our bristles are even adjustable depending on sensitivity (warm water=softer bristles, and cold water=firmer bristles) Make brushing cool again! Our triple headed, ergonomic toothbrush is also fun, and kids love the design. The one way motion allows for a simple, quick, and effective brushing that makes the experience not only bearable, but kids who have used our brush are even ASKING to brush their teeth like it's a toy! Check the reviews! Whether you or your child/loved one is crippled, disabled, or handicapped in any way, our 3 sided toothbrush has the ability to make all your brushing problems disappear, and even make it a fun time, and never again a battle to get teeth clean. All the while, you can know you are offering the ultimate solution because of our brushes ability to clean faster, smarter, and more comprehensively than any other type of brush out there! Get scrubbing!